Obesity Management (wet) For obese cats or for weight maintenance following weight loss. 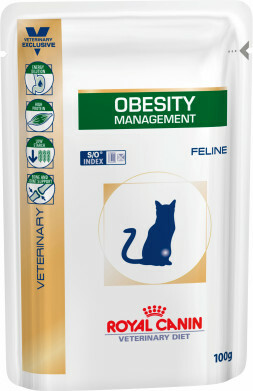 Also for cats with diabetes mellitus (type II) where overweight. Low energy density means feeding volumes are not reduced. 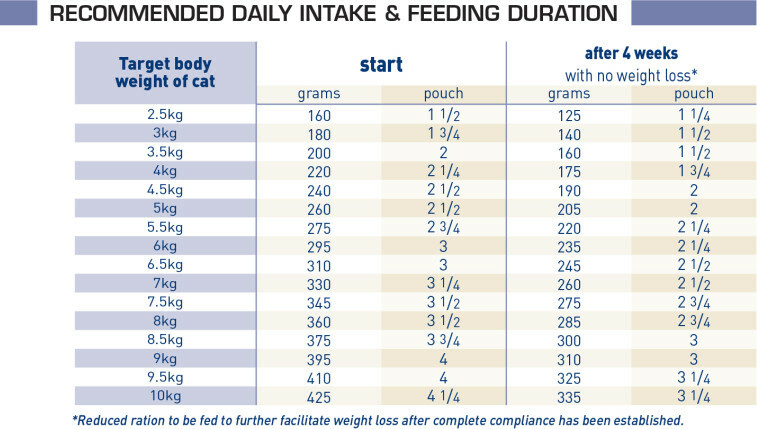 The high protein content (116g/1000kcal) helps to reduce loss of muscle mass by during a weight loss programme. Reduced carbohydrate levels help lower post-prandial hyperglycaemia. Pork meats, poultry meats, rice flour, egg white dried, cellulose, minerals (including chelated minerals), taurine, gelling agent, Fructo-Oligo-Saccharides (FOS), L-carnitine, hydrolysed crustacean (source of glucosamine), hydrolysed cartilage (source of chondroitin), marigold meal (source of lutein), vitamins. Crude ash: 1.9%. Crude fibre: 1.5%. Crude oil fats: 2%. Moisture: 84%. Protein: 7.5%. Vitamin D3: 190IU, E1 (Iron): 6.4mg, E2 (Iodine): 0.2mg, E4 (Copper): 1.7mg, E5 (Manganese): 2mg, E6 (Zinc): 20mg. Calcium sulphate: 1.2g.